LAKE FOREST, Ill. — The Lake Forest College men’s basketball team pulled away in the final eight minutes Saturday and topped Lawrence University 79-55 in the Midwest Conference regular-season finale. The win pushed Lake Forest into the four-team MWC Tournament and eliminated the Vikings. Mike Rueffer paced Lake Forest (13-10, 11-7 MWC) with 16 points, and Jordan Moran added 14 points and a game-high nine rebounds. 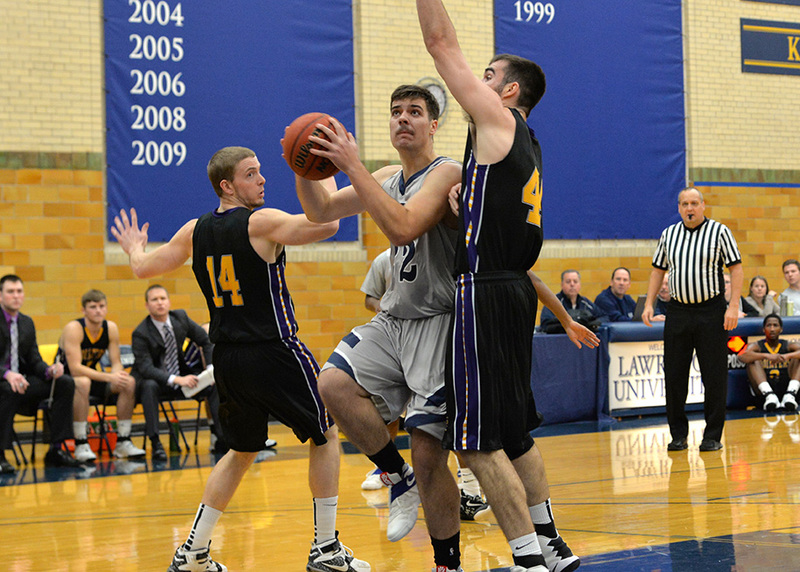 Ben Peterson came off the bench to lead Lawrence (9-13, 10-8) with 13 points, and Connor Weas added nine points. Jeremy Stephani, Evan McLaughlin and Mitch Willer chipped in with seven points apiece for the Vikings. Lake Forest led by nine when the Foresters scored 19 consecutive points to bury the Vikings. Rueffer scored nine points during the outburst that pushed Lake Forest’s lead to 79-51 with 1:14 remaining. Lawrence went 0-for-9 from the floor during that stretch. Ben Peterson (32) and his Lawrence teammates need to win Saturday at Lake Forest to earn a berth in the Midwest Conference Tournament. APPLETON, Wis. — Joel DePagter’s professional and personal life over the past month has been filled with as many twists, turns and loops as a good roller coaster ride. The Lawrence University men’s basketball coach has seen his team’s postseason hopes seemingly dashed and then revived. While that was going on, DePagter’s wife went into premature labor with their third child, followed by several tense weeks before a baby girl was born. 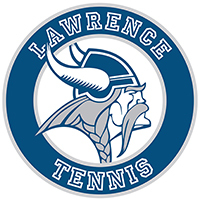 While much has transpired since January, the Vikings find themselves needing a win Saturday at Lake Forest in the regular-season finale to earn a berth in the four-team Midwest Conference Tournament for the first time since 2009. Lawrence (9-12, 10-7 MWC) finds itself in a three-way tie with Lake Forest (12-10, 10-7) and Cornell (11-11, 10-7) and two of those teams will join St. Norbert and Ripon in the tournament. It looked like the Vikings’ chances of a tourney berth were gone when Lawrence lost at Cornell back on Jan. 31 but then came Grinnell’s announcement on Feb. 7. Grinnell announced it was forfeiting four victories after self-reporting a secondary NCAA rules violation. That moved the Vikings from fifth place in the conference to fourth. “With my personal life, it’s been kind of a wacky month. The Grinnell thing shook up the conference and injected new hope for us,” DePagter said. The DePagter family was on edge over the past month as they waited for Alicia to give birth. DePagter didn’t travel with the team for several games because he didn’t want to be a four- or six-hour drive from his wife should the baby call come. “Every day was a little bit of am I going to be at practice tonight, am i going to be at the game? Of course, the baby comes on the night of a game,” said DePagter, whose daughter, Amaya, was born on Feb. 8 as the Vikings played at Ripon. Both mother and baby are doing well, and DePagter can finally focus more fully on his team. Being on the road shouldn’t hamper the Vikings either. 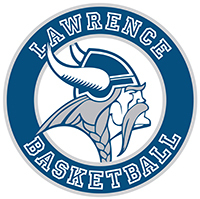 During DePagter’s tenure as head coach, Lawrence is 49-37 in Midwest Conference road games and 51-36 at home. The Vikings won at Lake Forest last season and are 4-4 in league road games this season. Lake Forest has lost three straight, including two to MWC champion St. Norbert, but the Foresters are big, physical and have several stellar shooters. “It’s the season for both teams. 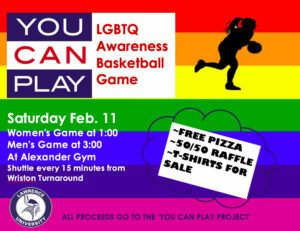 It should be a good atmosphere,” DePagter said. APPLETON, Wis. — The Lawrence University men’s basketball team kept hitting big shots in the second half Tuesday against Ripon College, but the Red Hawks answered every challenge and went on to an 83-67 Midwest Conference victory at Alexander Gymnasium. Lawrence cut a 20-point Ripon lead down to nine, but Ripon All-American Ty Sabin proved to be too much for the Vikings. Sabin went 11-for-18 from the floor, including 7-for-9 on 3-pointers, on his way to 34 points. Ben Peterson came off the bench to lead Lawrence with 21 points and five rebounds and went 5-for-10 from beyond the arc. Jeremy Stephani turned in another outstanding all-around game for the Vikings with 20 points, four assists and four rebounds. Freshman Abhishek Venkatesh came off the bench to score 13 points on 5-for-8 shooting and handed out three assists. Lawrence (9-12, 10-7 MWC) got off to a slow start and Ripon (17-5, 14-3) built a 41-25 lead at the half. Sabin started the second half by drilling a 3-pointer, and Ripon pushed its lead to 20 with 17:35 remaining. Lawrence started chipping away at the lead but trailed 60-44 after Sabin’s layup with 14:02 left. Venkatesh countered with a 3-pointer as Lawrence went on a 9-3 run, capped by a Venkatesh layup, to cut the lead to 63-53 with 11:19 remaining. Liam Lesniak answered with a layup for Ripon, but Venkatesh hit another 3-pointer to trim the lead to 65-56. Sabin stepped up and buried a 3-pointer, but Peterson answered with a 3-pointer for the Vikings. Sabin hit another 3-pointer and went on to score 13 consecutive points for Ripon as the Red Hawks pushed the lead to 78-62. Lawrence then went cold from long range and missed their next four 3-pointers. The Vikings didn’t get closer than 16 points the rest of the way. Despite the loss Lawrence remains alive for a Midwest Conference Tournament berth. The Vikings are in a three-way tie for third place, and a win at Lake Forest College on Saturday would put the Vikings in the tournament. APPLETON, Wis. — The Lawrence University men’s basketball team faces a pair of crucial games this week as it fights for a berth in the four-team Midwest Conference Tournament. The Vikings control their own destiny — win two and they’re in. Lawrence hosts Ripon College at 7:30 p.m. on Tuesday at Alexander Gymnasium and then wraps up the regular season on Saturday with a 3 p.m. game at Lake Forest College. Lawrence, Lake Forest and Cornell College are the three teams vying for the remaining two tournament berths. APPLETON, Wis. — It was a must-win game Saturday for the Lawrence University men’s basketball team, and the Vikings pulled out a gritty 68-65 Midwest Conference victory over Monmouth College at Alexander Gymnasium. The Vikings held off the Scots with some critical defensive stops and contributions large and small from a multitude of players. Lawrence is tied with Lake Forest College for third place in the league standings with both teams one game ahead of Cornell College as all three fight for the remaining two MWC Tournament berths. Jeremy Stephani and Ben Peterson paced Lawrence (9-11, 10-6 MWC) with 13 points apiece, and Stephani handed out a game-high six assists. Eric Weiss and Mitch Willer added 10 points apiece for the Vikings, and Willer grabbed a team-best seven rebounds. Lamont Mitchell led Monmouth (6-15, 6-10) with 21 points and 10 rebounds, and Monmouth’s Justin Aluya added 20 points on the strength of going 16-for-22 from the foul line before fouling out. Lawrence built a 13-point edge at 41-28 early in the second half, but the Scots chipped away and tied it at 53-53 with 6:15 remaining. It would remain tight the rest of the way, but Lawrence never gave up the lead. The Vikings built the lead back to four as Connor Weas hit a 3-pointer and then drained two free throws for a 61-57 advantage. The Scots trimmed the margin to 62-60 on a pair of Mitchell free throws with 2:55 remaining. Lawrence then got three consecutive defensive stops, including one when freshman Tyler Klug drew a key offensive foul against Aluya, who fouled out of the game with 1:51 left. After Paul Engo made a free throw to trim the lead to 62-61 with 1:07 left, Weiss came up with a huge driving layup to give the Vikings a 64-61 lead with 54 seconds left. A pair of Mitchell free throws cut Lawrence’s lead to 64-63, and Weiss was fouled with 28 seconds left. He made both free throws, but Mitchell answered with a layup for the Scots. Weas was then fouled with 14 seconds left and made both free throws for a 68-65 lead. Mitchell missed a 3-pointer with six seconds left, but Jon Matthews tracked down the rebound for Monmouth. His off-balance 3-pointer also missed, and the Vikings grabbed the rebound as time expired. RIPON, Wis. — A huge second half Wednesday led the Ripon College men’s basketball team to an 82-44 Midwest Conference victory over Lawrence University at the Storzer Center. Ripon shot 67.7 percent from the floor on its way to 54 second-half points. The nation’s leading scorer, Ripon’s Ty Sabin, went 9-for-15 from the floor and finished with 29 points, six rebounds and five assists. Jeremy Stephani led Lawrence (8-11, 9-6 MWC) with 11 points, and Ben Peterson and Quinn Fisher added 10 points apiece. Lawrence jumped out to an early 14-7 lead, but Ripon (15-5, 12-3) outscored the Vikings 21-5 over the final 11:43 of the first half and led 28-19 at the break. Ripon went on a 9-0 run early in the second half to push its lead to 41-21 with 14:57 remaining. Lawrence got back-to-back 3-pointers from Pete Winslow and Stephani to cut the lead to 43-27. That’s as close as the Vikings would get, and Ripon stretched the final margin by scoring the final 18 points of the game. APPLETON, Wis. — The Lawrence University men’s basketball team faces a pair of crucial Midwest Conference games this week. The Vikings travel to Ripon College on Wednesday for a 7:30 p.m. game at the Storzer Center. 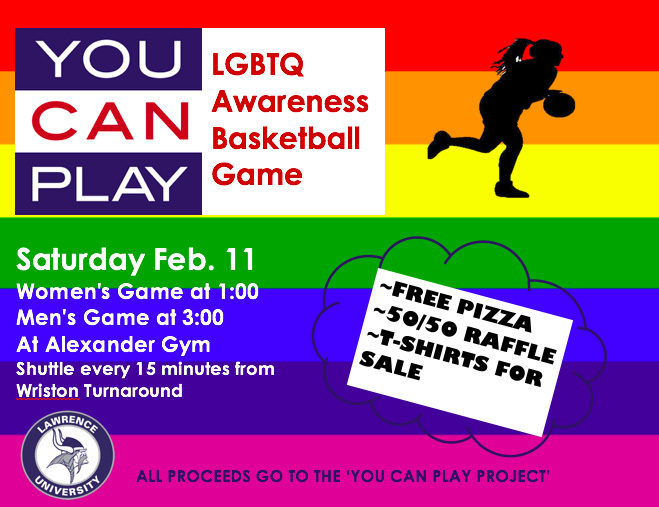 Lawrence then hosts Monmouth College on Saturday in a 3 p.m. game at Alexander Gymnasium. Lawrence is in fourth place in the MWC standings and fighting for a berth in the four-team league tournament. APPLETON, Wis. — Lawrence University’s Ben Peterson led a shooting barrage Saturday as the Vikings rolled to a 101-67 Midwest Conference men’s basketball victory over Beloit College at Alexander Gymnasium. Peterson poured in a game-high 25 points as he hit 8-of-10 shots from the floor, including 7-of-8 from 3-point range. Lawrence shot 66.1 percent from the floor, going 41-for-62, including 13-for-22 (59.1 percent) from beyond the arc. Jeremy Stephani added 19 points for the Vikings (8-10, 8-6 MWC), and Evan McLaughlin turned in a stellar all-around game. McLaughlin scored 11 points, pulled down a game-high seven rebounds, handed out a career-high seven assists and picked up three steals. Sam Noyce paced Beloit (5-14, 3-11) with 16 points off the bench, and Tristan Shoup added 12 points. Lawrence game out of the chute firing and built a 15-point lead eight minutes into the game. The Vikings missed their first two 3-pointers but made four of the next five, two by Stephani and two by Peterson, to lead 21-6. The Viking pushed the lead to 20 at 34-14 on a 3-pointer by Connor Weas, but Beloit did manage to trim the margin to 47-32 with 38 seconds left in the opening half. Peterson then buried another triple, got fouled and converted the four-point play. Lawrence’s Quinn Fisher followed with a driving layup at the buzzer to put Lawrence up 53-32 at the half. Lawrence went 8-for-13 from beyond the arc in the opening half. The Vikings quashed any hopes of a Beloit comeback early in the second half. The Bucs had trimmed the lead to 59-38, but Lawrence went on a 13-4 run. A Peterson 3-pointer and four consecutive points from Stephani capped the outburst and gave Lawrence a 72-42 lead with 12:42 left. Beloit never got closer than 28 the rest of the way, and Lawrence would lead by as many as 36.